So it’s a day late and a dollar short but I wanted to mention to two bloggers I had the chance to meet at the Maize Meeting a couple of weeks ago. 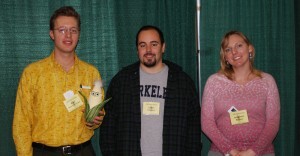 Anastasia Bodnar writes Genetic Maize, and Karl Mogel Karl Haro von Mogel writes Inoculated Mind, (and also makes his own corn pattern shirts!) and the two of them are both contributors to Biofortified along with Pamela Ronald, the author of Tomorrow’s Table, a book on the shared goals of genetic engineering and organic agriculture that I can’t recommend enough. It was a real pleasure to meet a couple of people who are really dedicated to communicating what we do as scientists to the general public. It was something I’d intended to do part time with this blog, but writing articles that actually inform takes a lot of work. From the search terms that bring in traffic to this blog, I can tell some of my traffic really is coming here looking for information of research. So I’m going to be making a minor layout change to this blog and add a list of blogs by those who really are blogging about plant genetics. These will be the first blogs I enter on that list.